ESO’s Very Large Telescope (VLT) has captured a magnificent face-on view of the barred spiral galaxy Messier 77. The image does justice to the galaxy’s beauty, showcasing its glittering arms criss-crossed with dust lanes — but it fails to betray Messier 77’s turbulent nature. This impressive luminosity is caused by intense radiation blasting out from a central engine — the accretion disc surrounding a supermassive black hole. Material that falls towards the black hole is compressed and heated up to incredible temperatures, causing it to radiate a tremendous amount of energy. This accretion disc is thought to be enshrouded by thick doughnut-shaped structure of gas and dust, called a “torus”. 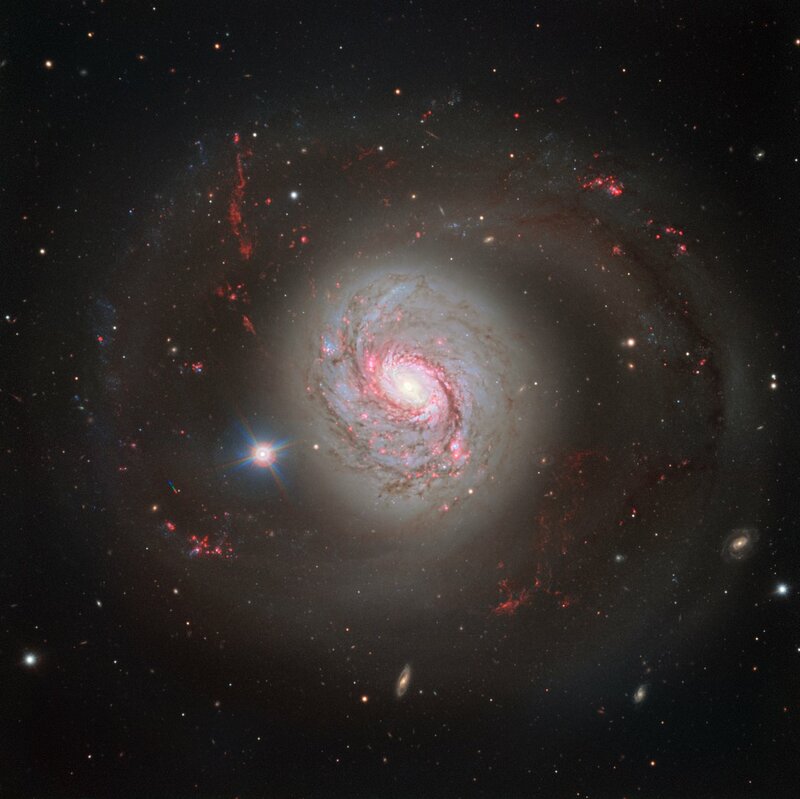 Observations of Messier 77 back in 2003 were the first to resolve such a structure using the powerful VLT Interferometer (eso0319). This image of Messier 77 was taken in four different wavelength bands represented by blue, red, violet and pink (hydrogen-alpha) colours. Each wavelength brings out a different quality: for example, the pinkish hydrogen-alpha highlights the hotter and younger stars forming in the spiral arms, while in red are the fine, thread-like filamentary structures in the gas surrounding Messier 77 . 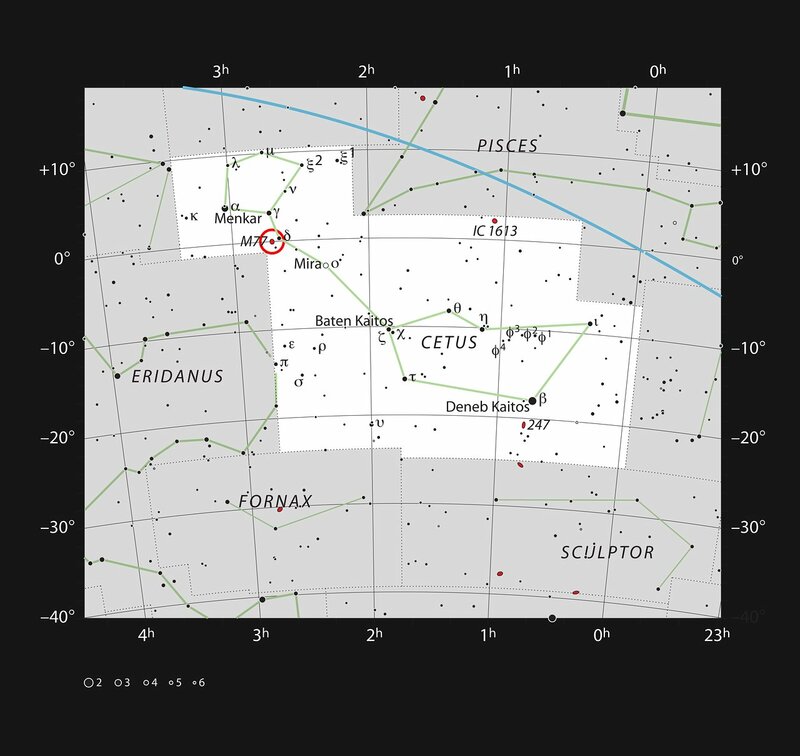 A foreground Milky Way star is also seen beside the galaxy centre, displaying tell-tale diffraction spikes. Additionally, many more distant galaxies are visible; sitting at the outskirts of the spiral arms, they appear tiny and delicate compared to the colossal active galaxy . 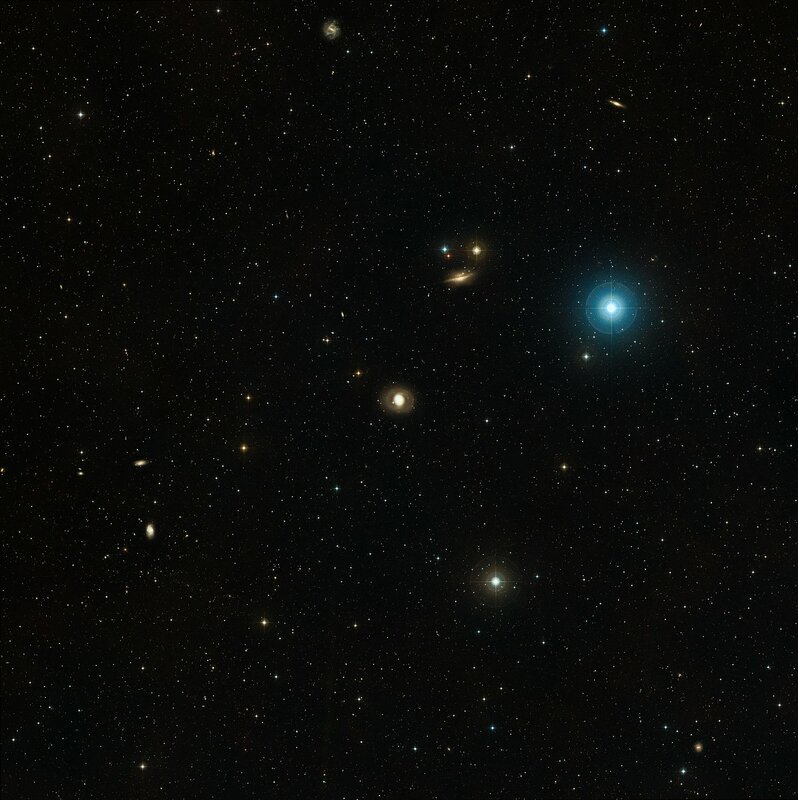 Located 47 million light-years away in the constellation of Cetus (The Sea Monster), Messier 77 is one of the most remote galaxies of the Messier catalogue. Initially, Messier believed that the highly luminous object he saw through his telescope was a cluster of stars, but as technology progressed its true status as a galaxy was realised. At approximately 100 000 light-years across, Messier 77 is also one of largest galaxies in the Messier catalogue — so massive that its gravity causes other nearby galaxies to twist and become warped (eso1707) . This image was obtained using the FOcal Reducer and low dispersion Spectrograph 2 (FORS2) instrument mounted on Unit Telescope 1 (Antu) of the VLT, located at ESO’s Paranal Observatory in Chile. It hails from ESO’s Cosmic Gems programme, an outreach initiative that produces images of interesting, intriguing or visually attractive objects using ESO telescopes for the purposes of education and outreach. Similar red filaments are also found in NGC 1275. They are cool, despite being surrounded by a very hot gas at around 50 million degrees Celsius. The filaments are suspended in a magnetic field which maintains their structure and demonstrates how energy from the central black hole is transferred to the surrounding gas. NGC 1055 is located about 60 million light-years away. 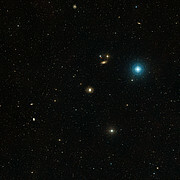 It is an edge-on galaxy, in contrast to Messier 77. This Astronomy Picture of the Day portrays both of them together, in a field of view about the size of the Moon (APOD).